Let the sound of Harrison Ford belly-laughing about Ryan Gosling's knitting habits heal and restore you. Harrison Ford does not seem particularly prone to humor. Sure, Han Solo smirked a couple times and Indiana Jones had a few solid zingers, but the guy does not go in for laughs very often. Even when he's doing comedy or directing New York City traffic, he's still playing variations of his standard exasperated, tough grump. But during an interview with ITV's Alison Hammond Thursday morning, Ford let out a side of himself that was once only seen in a few rare, behind-the-scenes Star Wars photos—the guy had a goddamn laugh attack. He and Blade Runner 2049 co-star Ryan Gosling were supposed to be talking about the new movie, which—while visually stunning and brilliant or whatever—seems fairly absent of jokes. Instead of discussing the film or telling that punch story for the millionth time, the two just riff about nothing in particular. The whole thing goes off the rails basically immediately and dissolves into a beautiful mess of goofy laughter. 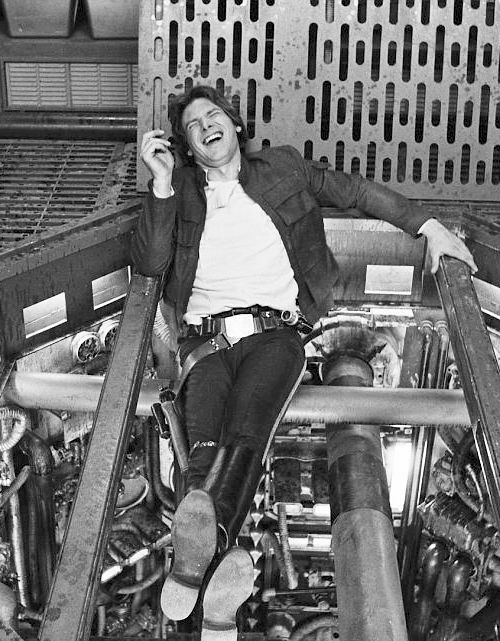 Harrison Ford chortles, he guffaws, he snickers and giggles and roars. Are these words one would normally associate with the guy who once stoically wrestled terrorists off Air Force One? No, but it happened. And it was glorious. Give the full clip a watch above, and let the sound of Harrison Ford belly-laughing about Ryan Gosling's knitting habits heal and restore you. You're welcome.